This is one of my favourite desserts, it is not too sweet and the luscious custard is a perfect finish to any meal. The crispy/crunchy topping is a fantastic contrast to the custard. You do need to plan a little with this dessert, but only from the point of ensuring that you leave enough time to allow it to cool and set in the fridge. It takes about 15 minutes to mix all the ingredients together then in the oven for 30 minutes and the rest of the time is leaving it to set. So make it earlier in the day and then just before serving you top with the sugar and melt the sugar so you get the crispy topping. Sit five 175ml ramekins in a deep roasting tin at least 7.5cm deep (or a large deep cake tin), one that will enable a baking tray to sit well above the ramekins when laid across the top of the tin. Pour the cream into a medium pan with the milk. Lay the vanilla pod on a board and slice lengthways through the middle with a sharp knife to split it in two. Use the tip of the knife to scrape out all the tiny seeds into the cream mixture. Drop the vanilla pod in as well, and set aside. Pour the hot cream into the beaten egg yolks, stirring with a wire whisk as you do so, and scraping out the seeds from the pan. Set a fine sieve over a large wide jug or bowl and pour the hot mixture through to strain it, encouraging any stray vanilla seeds through at the end. Using a big spoon, scoop off all the pale foam that is sitting on the top of the liquid (this will be several spoonfuls) and discard. Give the mixture a stir. Pour in enough hot water (from the tap is fine) into the roasting tin to come about 1.5cm up the sides of the ramekins. 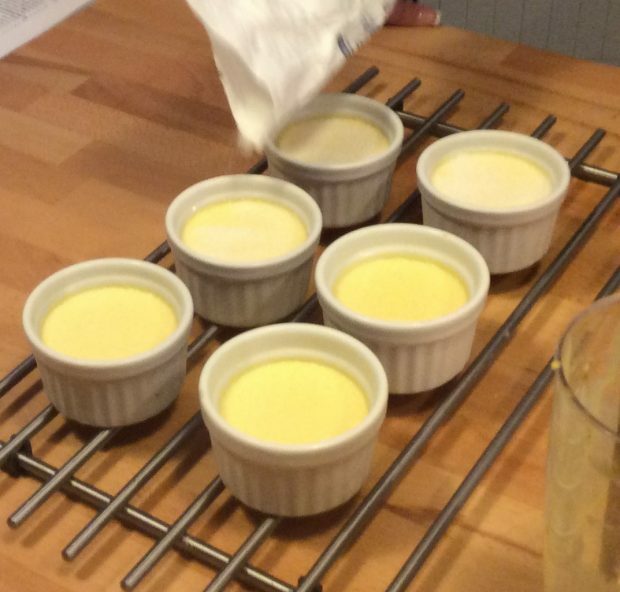 Pour the hot cream into the ramekins so you fill them up right to the top – it’s easier to spoon in the last little bit. Put them in the oven and lay a baking sheet over the top of the tin so it sits well above the ramekins and completely covers them, but not the whole tin, leaving a small gap at one side to allow air to circulate. Bake for 30-35 minutes until the mixture is softly set. 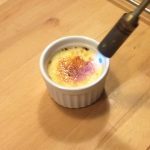 To check, gently sway the roasting tin and if the crème brûlées are ready, they will wobble a bit like a jelly in the middle. Don’t let them get too firm. When ready to serve, wipe round the top edge of the dishes, sprinkle 1½ tsp of caster sugar over each ramekin and spread it out with the back of a spoon to completely cover. Spray with a little water using a fine spray to just dampen the sugar – then use a blow torch to caramelise it. Hold the flame just above the sugar and keep moving it round and round until caramelised. 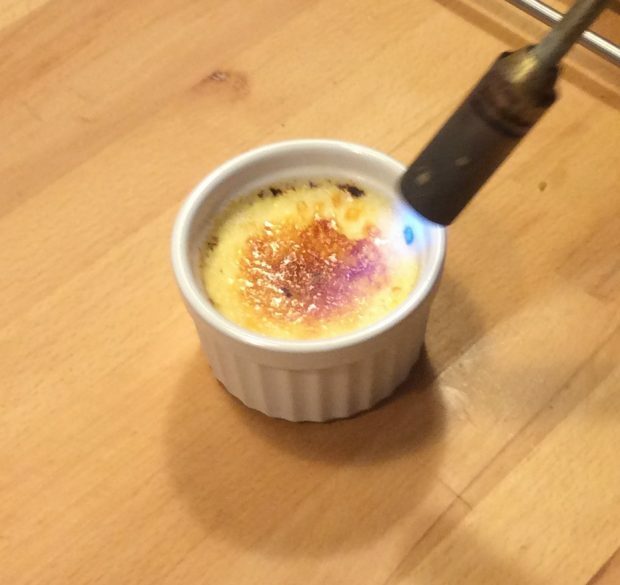 Serve when the brûlée is firm, or within an hour or two.